Court Festivals of the European Renaissance. Art, Politics and Performance. Ed. 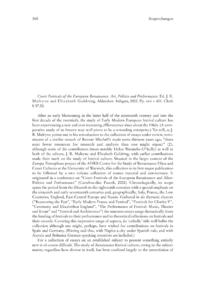 After an early blossoming in the latter half of the nineteenth century and into the first decade of the twentieth, the study of Early Modern European festival culture has been experiencing a new and ever increasing efflorescence since about the 1960s. (A comparative study of its history may well prove to be a rewarding enterprise.) Yet still, as J. R. Mulryne points out in his introduction to the collection of essays under review, reminiscent of a similar remark of Bonner Mitchells made some thirteen years ago, there exist fewer resources for research and analysis than one might expect (2), although some of the contributors (most notably Helen Watanabe-OKelly) as well as both of the editors, J. R. Mulryne and Elizabeth Goldring, with earlier contributions made their mark on the study of festival culture. Situated in the larger context of the Europa Triumphans project of the AHRB Centre for the Study of Renaissance Elites and Court Cultures at the University of Warwick, this collection is its first major publication to be followed by a two volume collection of source material and commentary. It originated in a conference on Court Festivals of the European Renaissance and After: Politics and Performance (Castelvecchio Pascoli, 2002).